TVB sends us a blast from the past in 72 Tenants of Prosperity. The Skinny: It may be just another Lunar New Year comedy, but 72 Tenants of Prosperity turns out to be much more fun than expected. Winning local details, some great stars, some not-so-great stars and solid jokes make this suitable holiday fluff for Hong Kong entertainment aficionados. Playing spot-the-star could be half the fun. by Kozo: They haven’t made a real stunner yet, but TVB is now 2 for 2 in their bid for big-screen credibility. After earning box office with the summer hit Turning Point, Hong Kong’s reigning television monopoly delivers 72 Tenants of Prosperity, a quasi-sequel to the Shaw Brothers classic House of 72 Tenants. 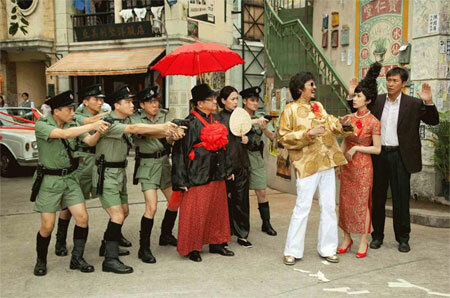 The film opens with newly-filmed sequences echoing situations seen in the 1973 original before flashing to the present to follow the next generation of local Hong Kongers as they fight and fume on Mongkok’s Sai Yeung Choi Street. Director Eric Tsang (and co-directors Chung Shu-Kai and Patrick Kong) manage genuine laughs and surprises in between maudlin sentiments and occasional awkward moments. Their ratio of good-to-bad is probably less than 3-to-1, but that’s still much better than TVB accomplishes on television. Success, like most things in life, is measured in relative terms. Like most Lunar New Year comedies, 72 Tenants of Prosperity concerns family dynamics and over-extended romantic situations. Kung (Eric Tsang) and Kin (Jacky Cheung) are former best buddies who let their friendship go to rot over Hong (Anita Yuen), who married Kung and bore him two children played by TVB regulars Bosco Wong and Linda Chung. Kin is currently their neighbor and has two children of his own, one played by TVB regular (See a pattern here?) Wong Cho-Lam. Not-a-TVB-regular Stephy Tang plays Kin's daughter, who's enamored with Japanese AV culture and just returned from Japan where she worked as an assistant director on AV films. What follows are some surprising gags acknowledging Tang’s minor resemblance to pornstar Akiho Yoshizawa (who's sometimes referred to as "AV Stephy"), and a set-up for a possible romance between Stephy Tang and Bosco Wong's characters. Since their families are estranged, that's your standard Romeo and Juliet storyline right there. Kung and Kin also get pissed at each other over work. The two run competing mobile phone businesses and occasionally spar at their local merchant meetings, where everyone grouses over a dastardly criminal who’s throwing bottles of acid from the rooftops – a reference to a serial crime in Hong Kong that’s received plenty of local media attention, not to mention parodies in Split Second Murders and Trick or Cheat. 72 Tenants of Prosperity trumps both those films by working that real-life detail directly into the plot, with the acid bomber essentially becoming the film’s “big bad”. Another potential bad guy is a Mainland property developer (Leung Tin) who may be looking to buy up Mongkok and evict the Sai Yeung Choi locals. The biggest bads, however, are Kung and Kin, whose feud is getting in the way of the mega-mega happy ending. The X-factor is Hong, who may have lingering feelings for Kin despite being married to Kung. Who will she choose? Her heartbroken former flame or the barrel-shaped man who fathered her children? If you answered “both”, then congratulations - you guessed right. No, Kung and Kin don’t engage in wife-swapping, but the film pretty much does what you'd expect, using every possible means to please the largest audience it can. By the end, love finds a way, the bad guys pay, and the big boys up north are portrayed as so nice that they'll help Hong Kong locals in need. The Mongkok locals eventually get Mainland funding for the "Paradise Project", a redeveloped version of Mongkok that’ll give everyone the happy and prosperous ending they're looking for. Also, Kung and Kin’s children get together romantically, meaning not only a Bosco Wong-Stephy Tang pairing but also a Wong Cho-Lam-Linda Chung pairing. All these stories are hackneyed and the emotions predictably syrupy, but to the film’s credit it sometimes manages to affect. A lot is due to the actors in question, e.g. Jacky Cheung and Anita Yuen sell it beautifully, while Bosco Wong and Stephy Tang aren’t quite as successful. Eric Tsang is Eric Tsang, in that he overacts effectively. You can easily evaluate the rest of the cast yourself. Shoring things up are often surprising gags. 72 Tenants of Prosperity gleefully parodies local issues and culture, taking shots at everything from shopping and eating to triads and recycling. Local celebrities get roasted; besides Stephy Tang being likened to Akiho Yoshizawa, the film notes Linda Chung's self-described resemblance to Wu Chun of boy band Fahrenheit, and makes multiple references to Jacky Cheung looking and acting like, well, Jacky Cheung. Wong Cho-Lam gets to show off his own surprising Jacky Cheung impression, and local films and television also get nods. The casting is also fun; Joyce Cheng Yan-Yee cameos in a flashback as the same character played by her late mother Lydia Shum, Prudence Lau reprises her Golden Horse award-winning role from True Women For Sale, and Justin Lo and Raymond Lam play – get this - younger versions of Eric Tsang and Jacky Cheung. Also, seeing Jacky Cheung and Anita Yuen back onscreen in a silly comedy is a joy on its own, and the massive parade of stars (well, television stars) has its attraction.